A zephyr full of rich, viagra tantalizing smells slips over me as I open the door to Dark Side Chocolates. This little shop in Cumberland is home to some of the finest chocolates in the world. Jan Peavoy, owner and chocolate artisan, infuses each truffle with flavor, history and passion. Peavoy’s dream of making unique, hand-made, organic chocolates is realized in this old building on Cumberland’s main street. The dark wood and granite case displays 18 different varieties of truffles, each one more beautiful than the next—Pomegranate-Orange, Salted Caramel, Beaufort Blackberry Currant, Mojito, Lavender Vanilla. Other specialties include flavour infused bars—such as Dark Chocolate with Lime, Dark Chocolate with Chilies and Cocoa Nibs, and Milk and Dark Chocolate with Coffee Beans—and hot chocolate “bombs”. As I sip on my mocha, savoring the combination of bitter coffee and sweeter chocolate, I am drawn into the history of chocolate and how it has come to shape Peavoy’s life. A little research into the history of chocolate reveals the diverse cultural history that led to chocolate as we know it today. The cocoa pods symbolized life and fertility to the Mayans, and stones from their palaces and temples have revealed carved pictures of cocoa pods. Though Columbus was introduced to the beans and the drink around 1492, he saw no value in either. It was Cortez that brought the cocoa beans to Europe in 1528 and suggested that the beverage be blended with sugar. The Spaniards mixed the beans with sugar, vanilla, nutmeg, cloves, allspice and cinnamon. This concoction quickly became a coveted recipe as the Spaniards held onto their secret for more than 100 years. By the early 19th century, the Swiss had created a chocolate factory and chocolate was being made in both hemispheres. Chocolate quickly became an affordable and popular beverage. It wasn’t until 1830 that chocolate was served as a confection. Solid chocolate was developed by J. S. Fry and Sons, a British chocolate maker. Throughout its history and across the cultures chocolate has been valued for its health benefits. Peavoy’s last point is key. The health benefits in chocolate come from flavonoids which are natural compounds with antioxidant properties. They are also found in green tea, red wine and berries. However, flavonoids are lost in the processing and thus, the more the chocolate is processed, the less flavonoids it will retain. Dark chocolate has four times as many flavonoids as milk chocolate and white chocolate has none. Out of the rich tapestry of chocolate’s allure, I ask Peavoy about her part in the design. What inspired her to switch from her previous occupation as a cycle courier to chocolate making? It was important for Peavoy to find out where the chocolates were coming from because of the potential for child slavery and malpractice in African chocolate harvesting. She wanted to know that the farmers got fair wages and that her chocolate wasn’t coming from plantations that wipe out huge areas of forest to plant rows and rows of cocoa trees. These plantations don’t thrive as well as they would in their natural environment, and therefore need pesticides and fertilizers. The largest chocolate producers in the world harvest mostly from Africa, where harvesting practices are slow to change. When asked if she has been to see the harvest and meet the farmers, Peavoy wistfully shakes her head, but brightens as she mentions the tip jar in the store that’s devoted to funds for a trip to Costa Rica. Peavoy hopes to be there to harvest next year. She points to a large narrow painting on the wall that at first glance appears to be a painting of chilies, but is, in fact, two cacao pods. “First the cocoa pods are cut open. Then the beans are scooped out and put in vats of banana leaves and fermented for a couple of days. That is when they start to develop flavor and change into a darker brown color. After the liquid is drained off, the beans are dried in the sun for two days. They are then ready to be shipped to the chocolate maker. These are the raw cocoa beans. It is becoming clear why chocolate has evolved slowly and through the efforts of many hands. It is no simple thing making solid chocolate from the beans of the cocoa tree. The day Peavoy decided she was going to open an artisan chocolate shop she went to the video store and rented Chocolat. After watching the movie she went online and looked up chocolate making schools and found a great three-month, part-time program out of Vancouver. She signed up the next day. With a new appreciation of just how complex this process is, I ask about the early days of Dark Side Chocolates. Her biggest hurdle was getting past the mistakes and ruining batches of chocolate. “They were still edible and my friends got a lot of chocolate, but it cost me a lot of money and a lot of frustration. And of course, it would usually happen when I was still up at one in the morning making chocolates for the Farmer’s Market. It is hard to leave the comfortable couches and intoxicating aromas of Dark Side Chocolates, but the tempering chocolate needs Peavoy’s attention and my box of chocolates is calling to me. Nestled into the black box are a double dark, tequila lime, chai spice, baileys and organic red wine truffles. I can tell that I will have no trouble finding inspiration in this box as I write. Dark Side Chocolates is located at 2722 Dunsmuir Avenue in Cumberland. You can also find their products at the Comox Valley Farmer’s Market, Edible Island Whole Foods and Brambles Market in Courtenay. Driving on Headquarters Road heading northwest out of Courtenay on a spring day, the world reads like a rapturous ode to the ideal of ‘rural.’ Fluffy white lambs frolic alongside their grazing mothers; green fields unfold gently under golden sunlight. The plum and cherry trees are losing the last of their blossoms, releasing pale petals out into the gentle wind where they spiral and eddy like confetti. Roadside signs advertise eggs, free-range meat, horse rides and bedding plants. The farmhouses and barns suggest lives that follow the rhythms of the earth, rather than the non-stop rush of cyberspace that seems to drive much of the Western world these days. At the end of a quiet gravel road is a grassy driveway that winds past grazing horses, sunny pastures and a well-kept barn, ending up at a welcoming country home. And in the house and up the stairs is a small room with a desk, computer, well-stocked bookshelf, and a view up the driveway—a writer’s den. This home—fields, barn, den, all of it—is where Susan Ketchen has done two remarkable things. One of these is tangible: a book. In her upstairs room-of-her-own, Ketchen produced Born That Way, a young adult novel she wrote in a three-month period and which was picked up by one of the first publishers she sent it to, Oolichan Press. No easy feat these days, when the vast majority of manuscripts submitted end up feeding the publisher’s paper shredder. The other remarkable thing is not tangible at all, but is perhaps just as rare: Ketchen has realized her childhood dreams. Pretty much from the moment she was old enough to think about her future, Nanaimo-born Ketchen knew she wanted two things: to ride horses, and to write. Although her life has taken her in a variety of directions, not all of them necessarily leading directly toward these two desires, she somehow ended up just where she wanted to be. 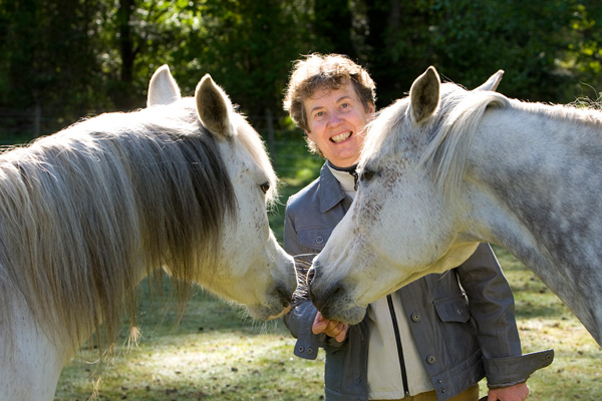 “Miraculously, I now live on a small hobby farm in the Comox Valley with my husband, two cats, two horses and a flock of chickens. I write and I ride,” writes Ketchen on her website. Riding and writing meet in her book, Born That Way. The 185-page novel tells the story of Sylvia, a 14-year-old self-confessed ‘horse-nut’ who, much to her frustration, has no horses in her life, beyond clandestine visits to a chestnut mare who grazes in a field near Sylvia’s home. Her mom is an overzealous psychoanalyst who, in spite of good intentions, smothers Sylvia with her psychological theories, seeing Electra complexes, unconscious sexual drives, and potential neuroses in Sylvia’s every thought and deed. Her dad is friendly and easy going, but distracted and unengaged. On top of all this, Sylvia is abnormally short. Why isn’t she growing? How can she convince her parents to let her ride? How can she take charge of her own life? The novel answers all these questions in an engaging, wise and often very funny account in which Sylvia gets help from unexpected allies including her pet barnacles, the Internet, a mysterious blond stranger, and a perceptive psychiatrist. But perhaps most important to her journey are her inner resources: a series of vivid and increasingly lucid dreams, and a deep determination that pushes her forward. Once she learns to trust and direct these inner powers, she begins to transform her life. “I wanted to write something that would be uplifting for me,” explains Ketchen. “It was winter when I was writing it. It was dark and raining. I wanted something light, not oppressive. Born That Way reflects Ketchen’s interests—horses, psychology and neuroscience—but it is not autobiographical, she says. The characters and events in the book originated in her imagination and were fleshed out with research when necessary. “You know, writers say things like, ‘Oh the character showed up and was in the room with me the whole time.’ Well that’s nonsense really, they are in our brain,” she says. But not necessarily the rational, logical part of the brain. The work of the imagination is still very much a mystery and Ketchen really doesn’t know quite how she came up with all the vivid and powerful details of her story. Writing, she says, has something in common with riding. “Both are tremendous challenges. You need to think of several things at once and also, you need…” She hesitates a long moment before continuing… “not to think. “Riding, physically, takes a lot of special muscles you don’t use otherwise. But it’s not just strength that you need. It demands a certain relaxation. You need to flow with the movement of the horse. “In writing, there are rules and conventions of grammar structure, but there is also the creative side. You can’t write good fiction just out of a rule book. Some of it has to come out of your more intuitive side. “I can have some intentionality—I’m going to come up here and work on Chapter 3 and I have an idea of where I want it to go. But if I plan it out too much, it’s not as good as the times when I let stuff come to me. “And that’s where the fun is, when the flow happens. Some of this book just came to me out of left field, I don’t know why or from where, and that’s what’s the most fun,” she says. This balance—keeping a degree of conscious intention while going with the flow—applies to Ketchen’s journey through life. “I very much believe in keeping my wits about me, but going with things as they happen as well,” she says. By the time she was 20 Ketchen was already competing in equestrian sports and had published a couple of short stories in Miss Chatelaine, a national magazine. She was obviously on track with her two goals, but a practical inner voice was pointing out that she might need to explore other fields if she ever wanted to make a living. And explore she did. Her university career was marvellously varied: “I studied everything that interested me: psychology, anthropology, sociology, creative writing, philosophy, economics, social theory, law, business. Just one problem: to earn an actual degree, you’re supposed to focus on something. And ideally, you don’t travel around the country sampling one university after another,” she writes. Well-educated but degree-less, she still knew exactly what she wanted: to have time to write, to have horses, to live on a farm. So she began a career as a financial policy and procedures writer with the provincial government. She invested in property, hoping to make enough to buy a rural acreage, but was stymied by a market crash. She leased a horse for a while, hiked, kayaked and kept at her job. Susan sent me a copy of your article, which I adored……..brilliant journalese, straight into the character of the person and a real knack for doing that well. I’ve nagged her into book signings at Spruce Meadows (!) as I’m Alberta based, and hope the book reaches out to many teenagers here too……… thoroughly enjoyed reading your article, thank you! …..loved your article, its style and real grasp of how to get into a person’s character…….I write (and teach) writing, reading, and backcountry material and this was pure pleasure reading …….. I connected up with Susan through a horse contact, and now have nagged her into a book signing in Alberta at Spruce Meadows (I’m Alberta based)……..I hope she finds a journalist there with your same acumen! A pleasure to read, thanks!